It doesn’t seem possible, but it is completely true. Traveling 365 days every year is less expensive than traveling just five or ten or fifteen days per year. And the reason for that is simple: living at home requires a huge amount of overheard that doesn’t exist on the road. If you don’t believe me, try it out for yourself. Tally up your five largest monthly expenses – such as rent/mortgage, car payment, state income taxes (by traveling full-time we get to choose our state of residency and ours, just so happens, doesn’t have an income tax) – and then multiply the total by 12. If you’re like most people in the U.S., the number you’ve calculated is somewhat greater than a realistic full-time travel budget. When we first started planning to travel full-time, we cut our expenses as aggressively as we felt we could. As you can see on the title graph, we successfully cut our spending by a quarter. At the time, we didn’t think we could cut more without seriously impacting our quality of life. 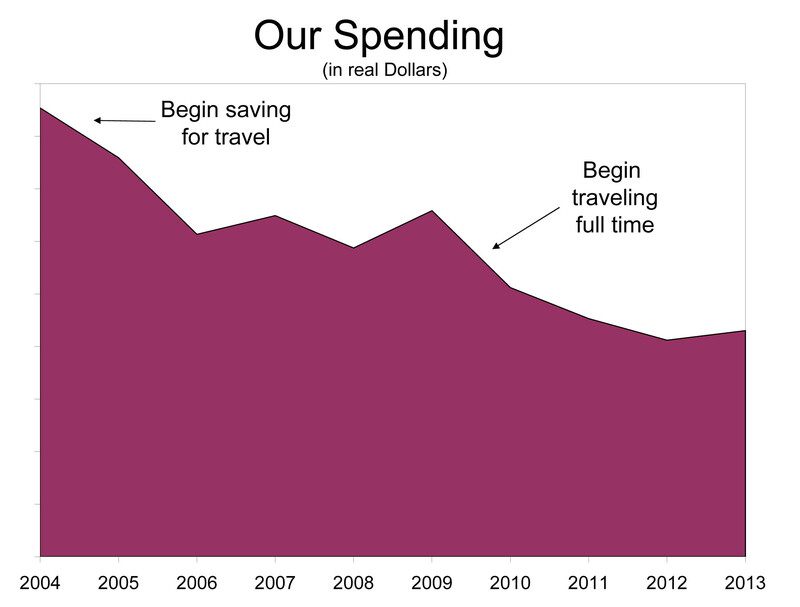 But a funny thing happened when we set out on the road: our spending fell by another quarter. The thing is, we didn’t try especially hard to economize on the road. We weren’t frivolous, but we probably could have cut our budget by another quarter by being more choosey about where we stayed and by staying places longer. And if we traveled more often in low cost parts of the world instead of staying almost exclusively in the U.S., we easily could have cut our expenses further. How is it then that nearly everyone considers travel an expensive luxury? Partly because vacation travel and permanent travel only bear passing resemblance to one another. Vacation travel is almost by definition an excuse for extravagance. Fancy hotels and elaborate meals are an important part of “getting away” from your everyday experience. But when your everyday experience is travel, those things quickly lose their appeal. Moreover, the pace of travel is completely different. Harried vacationers looking to pack every possible experience into their one-week trip will pay for conveniences that we often can do without. We won’t grab a cab when the metro will do. We’ll cook our own meals instead of dining out. We can wait around for discount or sometimes even free admission to places. We also don’t feel the vacationer’s need to pay for every last thing. Some places and things just aren’t worth the price of admission. With our surplus of time, we don’t usually worry about missing the nearest “once in a lifetime” opportunity because we know another one is just around the corner. Perhaps more important is the fact that the price of our travel experiences don’t come on top of the cost of our ordinary life; they are our ordinary life. We don’t need to make room in our budget for both rent and hotel. Our hotel bill is our rent. And for the truly budget conscious, couch-surfing, house-sitting, and boondocking opportunities can reduce that hotel bill to zero. So while many people wonder how we can afford to travel full-time, we often wonder how so many people can afford not to. Thanks for the encouragement! Full time travel is an enticing thought for some day… Happy and safe travels to you. it’s true!! i spent 7 months traveling across Continental Europe; criss-crossing through countries w/ a train pass. took ships to Greece, from Italy, and back. ship to Ireland, from France. worked in Ireland. flew back to Brussels, from Ireland. departed Luxembourg, flying back ‘home’ to NY. 7+ months, at a cost of LESS than $1000/mos. for TWO of us!! that’d pay for rent for ONE of us in NY. that’s w/o utilities, food, car insurance, and etc. i could have stayed in Ireland, almost indefinitely, had my wretched ex not MADE me come back. good times, 4real. Absolutely!!! It’s about making travel a priority. If we can do it anyone can!!! I always thought as much! We are not “vacationers” in the sense that we fill our days with expensive outings when we are traveling. We enjoy a street taco as much as we do a fine dining experience. Many cities and towns are “open air museums” (i.e. Oaxaca, Florence) and spending time walking around them saves on the cost of actual museum admission. I think we actually save money, as we are not shopping as often compared to being home, and stay in moderately priced hotels. Our trips are typically 2-3 weeks, and our usual destination is Mexico, a much less expensive proposition than Paris, London, etc. Happy travels and keep up the good work! Couldn’t agree more. Sometimes just being in a location and walking the streets is all the entertainment you need. This is absolutely spot on, I wish more people were aware of how affordable long term travel really is! I like your comment about how vacation travel and permanent travel are different. My husband and I have had a similar discussion recently but in a different context. We have a different scenario where we have purchased a house in one location and a cabin in another so that we “vacation” often throughout the year. We were commenting on how we no longer spend money on expensive meals, souveniers, attractions, etc., while others “on vacation” at the same location spend money left, right and center.It is a different mindset. We find we cook at home and do mostly free things. We no longer get the appeal of “luxury travel”. Of course we do have the house costs ( it is amazing though how low they can be other than initial investment if you are careful) but they were bought as investments as our interest rates are so low in our country that banking money no longer made sense, plus accommodation for a family of 7 is tricky to find. Anyways I just wanted to comment on how I completely understood your statement, but from a different perspective. There certainly is “more than one way to skin a cat” (although I’ve never understood why you’d even need a single way, but I digress.) The important thing is to find the way that works for you and to make the most of it. You are missing out the point where, while living at home, Income – Expenditure is greater than zero, while on full time permanent travel, income minus expenditure is less than zero. Unless you have ‘retirement income’. Au contraire, it is you who missed something; namely this little link included at the end of the article: How to Build a Mobile Business. It’s no longer true that earning an income requires you to show up in a specific location and punch a clock. So very true…we travel about 9 months out of each year, and folks find it hard to believe, but we truly spend less when on the road. Simply shut down the house and excessive spending. It’s true. When my family did road trip past 3 summer the cost of living was less than when we were home. Oh so true! We’re also ‘younger’ full time RVers working on the road… owned by a cat, and have been at it since 2006. We also have found that living on the road is far more economical for us.. especially since we’d have wanderlust anyway, and would be spending money for vacations and travel, on top of keeping a home base somewhere. We also love the variability of costs – you can choose how much you’re spending in fuel and campground fees, or even mix in volunteer work and workamping. Anyway, just found you guys via the Top 50 RVing bloggers list that we’re both on, and thought we’d stop on in and virtually meet ya. So hi there! Thanks for your article. We are planning an “RV travel phase” and I would appreciate your perspective on the maintenance cost for your motor home, looking just at routine maintenance for oil change, washing, tires plus any repairs you encountered. I think you purchased yours new so that should minimize repair cost in the early years. In planning our budget this is one factor that I don’t know how to estimate. If you want to reply privately you may email me at kevinlcooper@live.com. Thank you. We spent about $1,000 per year on average for maintenance – less in the first two years more in the last two. I’m not sure how representative that is though. We are sooo much in agreement on this that I included a link to it on our blog. Almost a year traveling and we’ve spent just about $5,000 less than our previous year at home, staying in nice apartments (no RV) and traveling by train, bus, and plane. Funny when you travel for long-term, you start to release a lot of the things you pay for back home and “need”, you actually don’t! In fact, sometimes you’re better without! It just takes being away long enough to realize it. Wow! This post is beyond informative, it made me think differently about long term traveling and I can clearly see your point! I was recently on a cruise and an older gentleman had mentioned after retiring it’s much cheaper to keep cruising and traveling than paying maybe the cheapest, $900+ for rent and to add to that utility expenses which are included in your stay. This post only confirmed that notion and opened my eyes. I will definitely be saving up for future long term travel. Thank you for the encouragement, and bravo to you for having the guts to do it! Hey Brian, I’m just now finding your blog from the Early Retirement forums. I remember you set off on your ER journey a few years ago but didn’t realize it had been 4 years already! I (FUEGO from the forums) ER’d last fall. I like this article – definitely highlights why long term travel isn’t really all that hard to achieve. We’re hitting the road this summer for a little over a month and I started subtracting out things we normally pay for (utilities, groceries, gas for the car, etc.) that we won’t have to pay. Even though we still have some housing expenses, we’ll save a lot that will go toward our travel expenses. What a fantastic piece! I never thought about it that way, but everything you mentioned is so true. I don’t really agree on the vacation thing…..Vacation is travel. Of course it’s a different kind of travel (unlike long term travel), but neither one is bad.